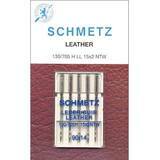 The wedge shaped point of Leather sewing machine needles are ideal for sewing leather, suede, vinyl, heavy faux suede, and thick non-woven fabric. 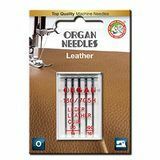 We recommend to pay close attention while sewing with a leather needles, as the needle leaves permanent holes due to it's size and strength. 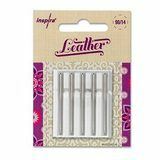 To avoid perforating your fabric, tie the thread ends instead of back stitching. 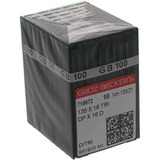 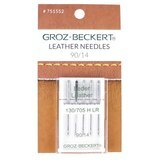 Leather needles are available in several trusted brands: Schmetz, Groz-Beckert, Klasse and Inspira.